Big, bouncy and bold. You could easily mix descriptors of Argentina’s wine with those of a top-shelf mag. Weak Day Wines and Monday’s all about 10.5% Chenin Blanc. And while some Old World wines struggle to reach double figures with respect to ABV, Malbec, Cabernet Sauvignon, Torrontés – indeed Argentina’s fermented grape juices – struggle to keep it under the 14% mark. As it happens, vino can’t be called vino in Argentina unless it’s at least 12%, according to the INV wine institute. But what happens if you fancy a cheeky glass or three at the start of the week but without the fuzzy head come Tuesday? My guide to Argentina’s Weak Day wines for when lower-than-usual alcohol fits the bill should help. For the next five days, I’ll be sampling a variety of sips under 12% so that you can enjoy wine from Monday to Friday. 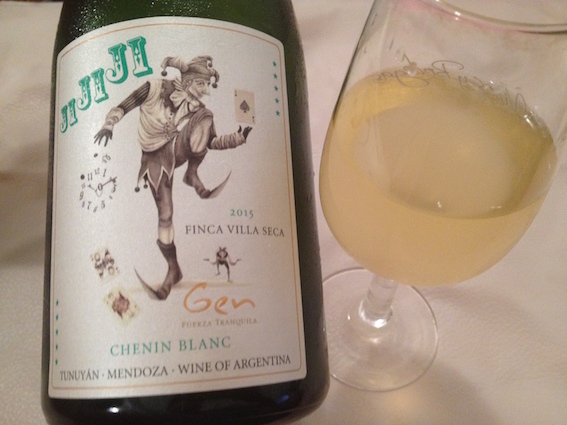 Weak Day – Monday: JiJiJi Chenin Blanc, Finca Villa Seca, 2015, Bodega Gen, Tunuyán, Uco Valley, 145 pesos. Cork. The grape? The rarely-seen-in-Argentina-as-a-varietal, the Loire’s Chenin Blanc that accounts for 5.68% of white varietals planted here. Winemakers: Gerardo Michelini – the other Michelini, as he calls himself, and wife Andrea Muffato. Anything else notable? Unfiltered so a cloudy lemon yellow. 93 Parker Points. From altitudinous Tunuyán in Uco Valley. Named after a song by Los redonditos de ricota. Taste me because: I’m light and refreshing. Apples, pears and chamomile notes hit the nose. Mid-high acidity will stir you, bright orchard fruits plus some lemon pith and a little lime will keep you there. A bit like sucking on an underripe pineapple drizzled in lemon juice. Serve at 9ºC-12ºC. Pairing: Going down remarkably well with Mauricio Couly’s cheddar cheese from Neuquén. A 175ml glass of wine at 10.5% = 1.7 units. A 175ml glass of wine at 12% = 2.1 units.